Hello! There's something so refreshing about monochromatic summer looks that I absolutely love. Bold color aesthetics and retro styles influenced the styling behind this monochromatic outfit. 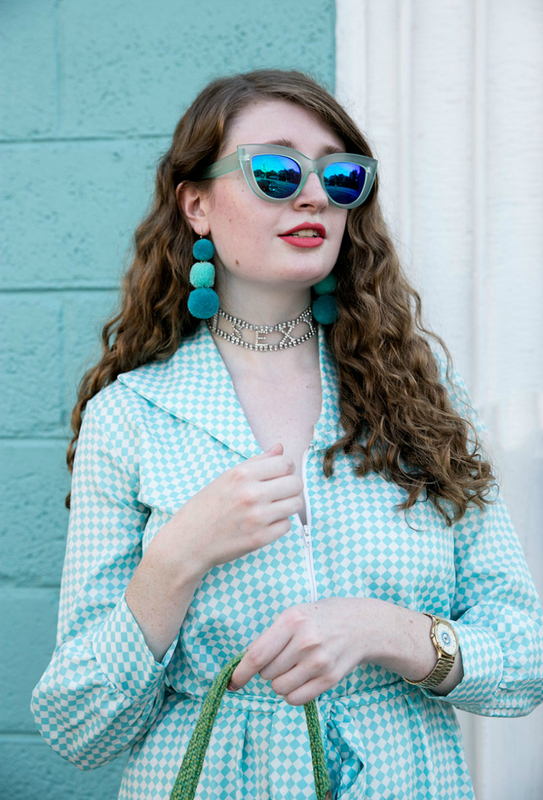 I styled the look around one of my favorite vintage dresses in my wardrobe: this teal and white checked vintage beauty. This dress isn't only beautiful but also full of character. I posted about its character earlier on my blog here if you're interested in checking it out. I accentuated the teal color of the dress with a coordinating pair of pompom earrings and cool cat-eye shades. I love how the retro style and cool blue-green color of the sunglasses reflect and enhance both the retro flair as well as the color of the dress. A bold rhinestone choker necklace, a swipe of peachy pink lipstick and floral mules perfected the look.